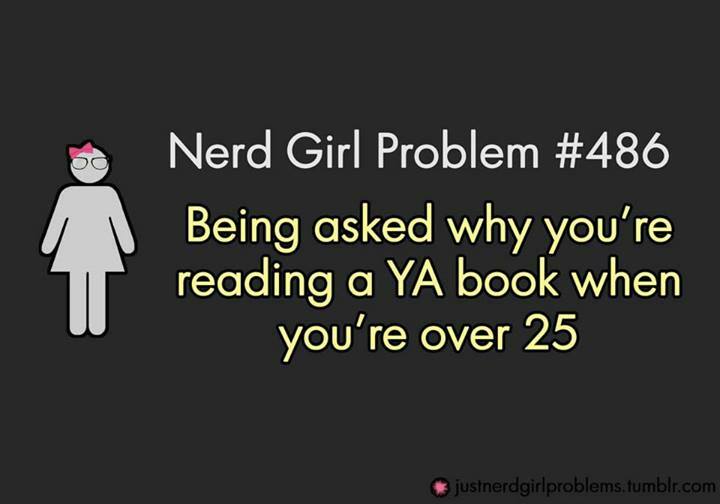 Adults Reading YA Books: How is This a Problem? What’s your first response when you read this? Mine was “what does it matter?”, followed by the urge to blog about how ridiculous it is that there’s a need to defend oneself against this judgement. I found this meme a few days ago while reading through my Facebook News Feed, posted by another author. Then yesterday, I discovered this article by Giselle/Book Nerd Canada in response to a posting on Facebook. Why is this even a thing? What purpose does it serve for one group of people to look down upon another just because someone considered an adult wants to read books which are aimed towards younger adults? As far as I’m concerned, if you like reading YA books, knock your socks off. No one should have to defend themselves against something like this. A story is a story, regardless of age. The story may be their thing based on an individual’s point of view, but it is what it is. Readers read want they like. Adults have the ability to choose what they want to read in most parts of the world, and if they find YA exciting and interesting, great! You know what it means? It means people are reading. That’s it. And you know what? That’s the important part we ought to be focusing on. In a world where we value literacy, that’s the goal we should be keeping in mind. Not to mention that it means storytelling lives on! The desire (and need, as some would argue) for our species to tell stories, share, and communicate ideas and experiences is incredibly alive. Adults need stories as much as our youth. So what if a particular story may be presented through the eyes of a 16 year old? We should be more interested in understanding the messages in that story. We need those messages. We need to hear the same things over and over whether they be messages of love, hope, need, overcoming challenges, becoming a better person, or exploring the strengths and weaknesses in the human condition. We also need the dialogue created around those stories. What can we learn? What does it tell us about ourselves and each other? Just the simple act of coming together to say how something touched us brings us closer together as people, sharing something beautiful. Sometimes it leaves inspiration behind, becoming a creation that sparks creation. Now that’s some real magic. Let’s be honest: age is just one variable to make a story, helping to give it perspective and an identity. Tell a story with a 16 year old protagonist. Then, tell it with a 50 year old. It won’t be the same because of their experiences but that’s what makes them equally special. The world seen from the eyes of the youth will be different than an adult – but that’s not a bad thing. It provides a rounder viewer of the world, especially when you’re an adult in an adult’s brain. While we used to be “that age”, we get wrapped up in “what adults do” in the “grown up” world. I’d like to think that being an adult willing to delve into the YA stories allows for broader perspective and openness. It can be a fantastic exercise. On one hand, we can connect better to our adult selves. At the same time, we can connect to our younger selves – maybe even learn more about who we were as youths when we didn’t understand. That knowledge may even allow us to better understand who we are as adults. Adults read YA books because they want to. Because they derive something from it. It’s not the same something, but there’s something they like. Something that grabs them. There’s absolutely no reason anyone should feel the need to justify it. No reason to be shamed. No reason to be considered “abnormal”. The meme above shouldn’t have any reason to exist. The Facebook excerpt in Giselle’s article shouldn’t have reason to include the labels of “weirdly YA-obsessed adult”. This sounds a bit backwards and warped to me, this attitude that YA is somehow lesser than its adult counterparts. Treating YA literature as if it’s good enough only for youths and not adults doesn’t make sense … especially considering we want our youth to read these stories during their formative years – the time when the things influencing their minds and actions are so incredibly important, ushering them into who they will be as adults. These are the stories that teach them messages and meaning, that give them new perspectives and ideas, sparking the flames of imagination and new thinking. Instead of looking down on YA literature as if it’s “dumbed down”, we need to be giving the YA genre the best of the best to give our youth the best. We need to see YA literature as important to us all. Treating it like low-grade, second rate literature does us all a great disservice. Because really, if as adults we judge it as crap, why are we allowing our youth to read it? These are the people who will control the world in the future. Let’s give them some respect, and respect the works written with their demographic in mind. And lastly, I want to flip the issue and look at it from an author’s perspective. It’s an insult. If people think adults reading YA books is weird and abnormal, what does it say about the adults who write them? Only a portion of society are writers; of them, only a portion write YA literature. It’s not for everybody, requiring passion for the stories and an ability to get into the YA thinking which not everyone can do. We won’t discriminate against the ages of our audience, though. We can’t afford to, sure, but why would we want to? If adults want to read the YA stories we write, fantastic! Thanks for reading because every individual counts. If we touch anyone’s heart and/or mind, that’s gold – regardless of age. I’d also like to point out that in many cases, it’s adults who get the YA books into YA hands, from publishers and reviewers to parents and teachers. It’s particularly helpful if parents read the work and pass it on to their kids. They can directly influence youth to read and know what the kids are reading. Adults who read YA and share those stories with their kids are amazing – not only are they being a great role model and responsible parent, but there’s a chance to relate to each other and talk about something. There’s an opportunity for communication and sharing between parent and child. And that’s beautiful. I think I’ve finally found the end of the post. To wrap it up, I just want to leave it with some positive thinking. Reading is reading. Investing the time into storytelling is time well spent. We’ve got young adults who read adult literature. We’ve got adults who read YA literature. At the end of the day, people are reading. Let’s just focus on that and let the rest fall away. Categories: Young Adult Literature | Tags: YA literature, young adult | Permalink. Thanks for dropping in. I know, it’s looking sparse around here. I’m working on getting this theme fixed up and info loaded in. The virtual curtains, sofa, TV and munchies should arrive soon. In the meantime, a little about me: I write fiction for young adults. It tends to come up fantasy but I’m not one bit surprised when something of other speculative forms comes up. I’ll make this post short … which could be considered amazing in some cases since my favourite things to write are novels. With that said, I’ll leave you with a touch of trivia about me. (1) One of my favourite YA books: Master of Murder by Christopher Pike. I’ve read it so much, the cover of my paperback is no longer attached. No wonder: it’s about a writer. (2) One of my favourite movies: Taming of the Shrew starring Elizabeth Taylor and Richard Burton. ♥ “AAAAMENNNNNN” (watch it and this will make perfect sense). (3) What I wanted to be when I graduated high school: A cryptozoologist. Awesome job combining the study of animals with the unknown. Did you know that Giant pandas were considered a cryptid? People didn’t know what they were and believed they were only found in Chinese folklore. They turned out to be real. Nice. Wrapping this up now … be back again soon.